Our Cheapest Bedroom Suite. A chamber suite of two pieces, suitable for hotels or for bedrooms that are too small for the larger size three-piece suites. This suite is made of the best selected seasoned hardwood, is thoroughly well put together and is finished golden. Is 6 feet high with 4-foot 2-inch slats. Top of headboard is fancy pattern shaped and decorated with heavy molding, giving it a very neat appearance. 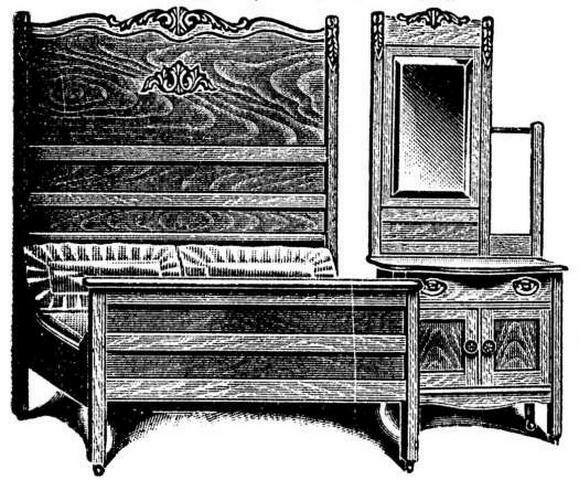 The combination washstand and dresser is 30x18 inches, of a style which matches the bed perfectly. The top is handsomely carved. The dresser is fitted with large, roomy drawer and large compartment below. The mirror is of excellent imported German plate glass and is 14x24 finches in size. No. 1T1615 Weight, about 90 pounds. No. 1T1616 Weight, about 75 pounds.